(From Pentax lens literature) The smc Pentax DA 35mm f/2.4 AL is a standard lens designed exclusively for use with Pentax digital SLR cameras. This new lens is versatile enough to be used with a wide range of subjects and applications for high-resolution images with edge-to-edge sharpness. It is a perfect choice for digital SLR beginners to familiarize themselves with the basics of using interchangeable lenses. 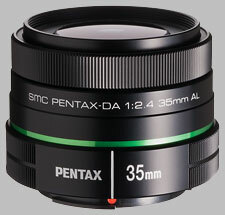 The Pentax DA 35mm f/2.4 AL lens will ship in October for $219.95 USD. this is a hot tip for engaged photographers. between f 4 and f 5,6 it reaches highest possible sharpness. Even in the edges/corners very high sharpness. My close-ups of fowers: each shooting a feast for my eyes. This is the highest IQ lens I have used on my K-5. This lens is sharp wide open. At f/4 and above the sharpness, contrast, color, and overall lack of aberrations leave little PP work to be done. You can shoot right into the sun with no flair (be careful). It has lower CAs versus its FF big brother. I believe this version is an improved version; although a bit slower. Edit: When I run across my reviews if time has lapsed far enough for an update I will do so. I have owned this lens for about one year. All statements still stand. No wear on the lens mount. Still tight feeling. The lens is very fast to focus. Using a round lens hood made for lens of 50mm (FF = of this lens) makes a notable difference in contrast and overall pic quality in some situations! This lens has become my go to lens over my Sigma 17-70mm f/2.8-4.5 Macro; in most situations. Say a quick snap of people, web shots, or just things. The DA35mm is lighter and a bit sharper. The Sigma is no slouch however. Very versatile focal length. I can see now why all should own a true 50mm lens. And this is a solid low cost but high IQ lens for Pentax shooters. Lightweight, good I/Q, fast focus, cheap. Had this for a week now and used it for several jobs. Good image quality, light on the front of my K5. A good combination for walk-abouts and indoors with flash. Also used it on some table-top sets with wireless flash and it does a good job. Should be in every photograpers bag at the price. This is an extremely sharp lens, that beats every optic I used since today on my K-5. Using f/4 up to f/5.6 you'll reach the sweet spot of sharpness. The bokeh is just nice to have when using f/2.4 or f/2.8 because of the just 6 aperture blades. The AF is extrmely fast and never misses the target. What I don't like that much is the plastic feeling. On the other hand that's why the lens is lightweighted. I would buy that lens again!! !